I have never seen an episode of The Lone Ranger. Well, I guess I would have been negative thirty when it was on, and that even my mom wasn't alive when it aired. But regardless, I've never even seen a rerun and I don't know anything about the series other than the basic stuff: the Masked Man, Tonto, Ke-mo sah-bee, and Hi-Yo Silver! Away! So I went into the theatre completely unbiased, as far as the classic story is concerned anyway. What I had in my mind, though, was Pirates of the Caribbean. Of course, both movies are products of Disney, both are directed by Gore Verbinski, and both feature Johnny Depp wearing the exact same outfit, minus one dead crow. So what I expected from this new take on an old tale was something along the lines of The Curse of the Black Pearl; comedy, action, an old tune redone, and an appeal to all ages. And while critics might be slamming the film, I got exactly what I expected and so wasn't at all dissatisfied. 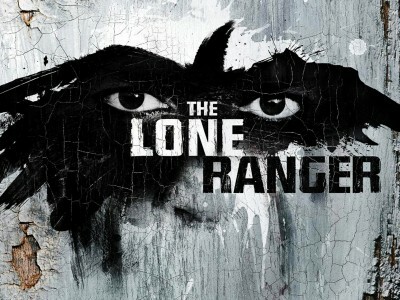 This tale is not about the exploits but about the formation of the Lone Ranger. It tells the story of John Reid, a idealistic lawyer returning to his home town in Texas in order to bring the future of law to the land. His brother, Dan, represents the old way; posses, mustaches, and trials by gunfire. When the brothers encounter the extremely dangerous outlaw Butch Cavendish, their styles might clash but they both seek justice. But John is in over his head, as he barely escapes an ambush with his life, becomes unwittingly entangled with the crazy Comanche Tonto, and must hide behind a mask in order to save the day. Not only must he battle Cavendish, but he also has to rescue his brother's wife, vie with the local bigshot, and unravel a mystery involving a fortune in silver, the railroad, and a greed that has turned even the land on its head. It's a pretty wild story and an extremely wild ride. From the beginning I had immediate trouble getting into the story and a bunch of red flags were waving. The action was overwhelming, and I suspected it of hiding a mediocre plot and cast. And when the dust settled, a few of those doubts were proven. The plot was full of holes and it was all going too fast to make any sense of, like a roller coaster on rusted rails that's just barely hanging on. The comedy was juvenile, full of horse poop jokes and whacks on the head. 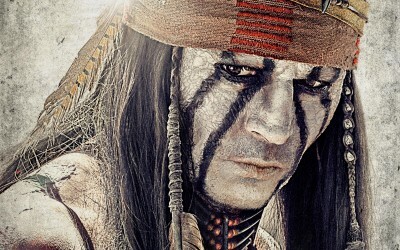 And the acting was suspect: Armie Hammer as a Texas Ranger and Johnny Depp as a Native American. Was I supposed to be believing this? Was I supposed to be taking it seriously? If so, then there was a major problem. It was just too silly, with too many dumb jokes and a horse that seemed to be magical. If it were a serious film than someone made a mistake. But then I realized the flip side. It wasn't meant to be a drama. It wasn't even meant to be an action film. The movie was created for the sole purpose of being entertaining and it was in every way. No it wasn't smart and no it wasn't very believable. It was often ridiculous, always fun, and gave a nod to the popularity of the original story. Sound familiar? 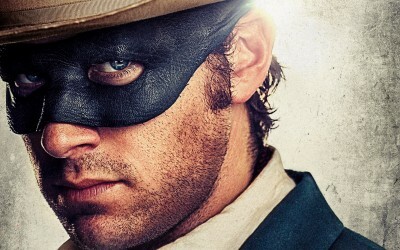 I'm not gonna say it was as good as the first Pirates of the Caribbean movie, which had a quality that they're still trying to recapture with a dozen sequels, but The Lone Ranger was a package well delivered; one that can appeal to all ages, make people laugh, and hopefully bring in some cash. Too often audiences and critics can't move past their own expectations. I'm guilty of it as much as anyone, but in this case my expectations were met. I got a PG-13 Disney movie that was action-packed and exciting. A kid could watch it and have a great time & an adult could watch it and enjoy their evening. It wasn't Unforgiven by a long shot, but it's a movie worth a watch, as long as you can accept it for what it is.